I feel like weeks can often pass by without me actually noticing that I've literally not had a moment of pure "me" time. I'm definitely guilty of being that kind of person who has to constantly be doing something, anything! I'm a sucker for a "to do list" and I'm constantly filling my day with proactive tasks. Truth be told I'm a little bit of a work addict and as much as I've no problem with that admission when I really stop and take a pause from maximum-turbo, productivity (would that be my power if I was a superhero? I hope not) one of my favourite little pleasures is just every once in a while doing absolutely nothing in particular. It's like all the busyness of my day to day actually inevitably makes those pause days that little bit extra special. Every now and then, just as a little treat to me/from me I love nothing more than to take time out, catch a train into the city centre and aimlessly wonder with a coffee in hand. It's one of those days when minimal effort is given and I don't mean just with making plans, I mean with everything! I choose an outfit which is quick to piece together and makes me feel super comfy. The best me. I'm sure you guys are aware by now but "lazy", effortless outfit planning is completely my vibe and what better day to demonstrate this sense of style than on a mellow Sunday. That said irregardless of how little effort you're putting into your outfit, we all still want to look as stylish and as great as possible right? The nice thing about "lazy" styling is it actually IS still possible to look as on trend as possible and I'm going to show you how. I've selected a few rather lovely key pieces from the new V By Very range which can either be worn together as one super easy and breezy outfit or alternatively, separately as this season's staple items... Let's be honest, it's always an extra little win getting as much wear as possible for your money! For my Sunday strolling outfit I've selected a classic black and white polka dot ruffle blouse, teamed with a must have denim midi skirt and layered on top a blush pink pointelle detail cardigan. This for me is an ideal outfit for feeling as relaxed and comfy as possible whilst looking right on point for spring! A midi length skirt is such a great piece to invest in if you're trying to nail your transitional Spring/Summer wardrobe. It's not too short which means you can ease into baring all where your pins are concerned and it's not too long that you feel like your still stuck in winter mode! As Goldilocks would say "it's just right"! Plus choosing a denim fabrics makes this item the perfect day alternative to jeans. Team further into summer with a camisole and sandals for a little more sizzle to your outfit. What I really love about the polka dot ruffle blouse is how versatile this piece is! It's actually a peplum shape, which you can't quite see from my styling because I've sneakily tucked it in. But I love that! It's wearable in so many ways! Whether it's- like myself in these photos- tucked into your favourites jeans/denim skirt or worn out over a pair of tailored trousers for a much more sophisticated, evening look, this top covers a multitude of bases. The beauty of polka dots is they absolutely never ever go out of style and this is an item which will happily see you right through into Autumn too! What a little keeper hey? 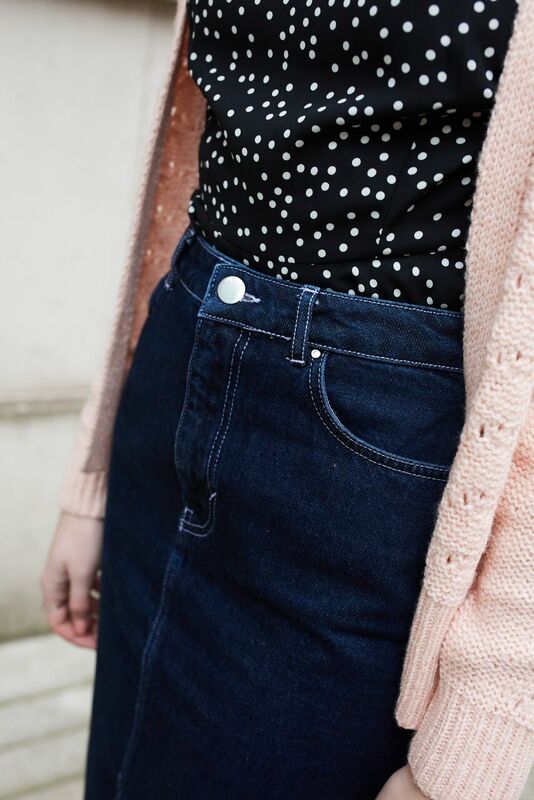 What's more I absolutely adore the spots teamed with the blush pink in my pointelle cardigan and I think together they create a really playful, carefree feel. This pastel pink tone really works for Spring as not only will it suit your floral prints down to the ground, it looks like an absolute dream teamed with denim. I realise it's not quite "no coat" weather just yet, but when it is this cardigan will act as a perfect replacement. All in all this outfit is super stripped back, ridiculously easy to style together and completely comfy! It's my idea of the staple easy breezy outfit to go with an equally easy breezy Sunday. Finishing touches? Just simply accessories with one grande latte in hand and you're free to stroll.